Deafwhale Society, the oldest whale conservation group in the world! 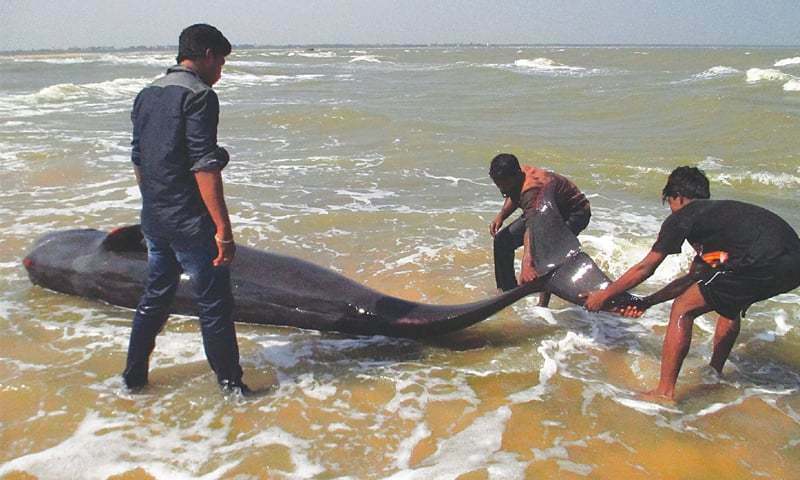 More than 100 short-finned pilot whales washed up on Indian shores; 80 died on the beach. The rest were towed back to the sea by motor boats. Watch the Video above. Notice the strong wind blowing towards the shore. Also, notice the white-caps and the wind-driven currents washing to the beach. The strong flow of the current is guiding the whales to the sand. They obviously have no sense of direction. This is exactly what one would expect if the pod had suffered a prior pressure-related injury that had disabled their ability to echo-navigate. In other words, their travel path is under the control of incoming current, not the whales. The only logical answer is that they were lost at sea long before they reach the shoreline. The whales began washing up on Monday night January 11, 2016. They came ashore after the tide had dropped to its lowest and started to rise again. In other words, they came in with the inflow of the rising tide. The current washing ashore prevented them from turning and returning to the sea. Fisherman tried to drag them back out to deep water, but you can tell in the video that pushing them back to deep water against the incoming waves was never going to work. The lost whales simply turned and swim back to the beach as soon as they were released. The rescuers did not realize these pilot whales had no acoustic sense of direction and were being pushed back to the beach by the incoming surface currents. They were NOT following a leader. They were not disorientated. They were simply unable to navigate! To get these whales to swim away from the beach, the rescue team needs to push them out to sea during a relatively calm when the tide is flowing out to deep water. This is because, as mentioned above, beached whales are guided to shore by the incoming current. If their biosonar system was working, they would never have been deposited in the sand. before reading the rest of this article. I also ask that you imagine what it would be like to be a lost pilot whale with no idea where you are, or where you are headed. You are in your pod, but your pod is as lost as you are. Sharks are trailing behind, looking to pick off any stragglers. Your pod keeps swimming to stay ahead of the sharks. Since you don't know where you are going, the surface currents guide you downstream in the path of least drag (resistance). There is a strong wind blowing ashore, turning the flow of the surface waters towards the beach. To see what happens next, watch the video posted by BBC India on Tuesday, January 12, 2016. You can clearly see that some of the whales are free to swim in any direction. The problem is they do not know which direction to swim because the entire pod is as lost as a blind man thrown overboard 50 miles offshore. Indian officials mistakenly said the cause might be the loss of the pod's group leader. But they are not following a group leader; they are all lost. Whale scientists tell us that "pilot whales depend on leaders for guidance, and would be lost without a leader." This idea has no merit since it implies that pilot whales have been mass beaching themselves for millions of years just because their leader got sick. How stupid! Any gene that induced such suicidal behavior because the pod leader was sick would have long ago been eliminated from the gene pool. There would be no pilot whales because all the pods would commit suicide when their leader got sick. The same applies to a mutated gene that would cause them to follow a sick whale to the shore because they could not deal with the emotional pain of allowing a pod mate to die alone. There is no evidence to support either of these stupid concepts. Both are rooted in human imagination, not in self-preservation as practiced by wild animals. Another dumb idea advanced by scientists is that they were chasing squid too close to shore and accidentally ran aground. This idea holds no water because all mass stranded whales are found to have no fresh food in their stomachs when examined. In addition, they are super dehydrated. Odontoceti whales extract all their fresh water from their food... they would not be dehydrated if they were feeding! And they would be diving and feeding if their biosonar was working. Furthermore, whales swimming ashore because their biosonar does not work on a sloping beach or because sand and air bubbles kicked up by a rough surf blocks their navigation signals, is not well thought out. Pilot whales have evolved in the oceans for 55 million years. For 30 million of these years, they have used a biosonar system to navigate everywhere they go. Common sense tells us that they would never swim into an area where their acoustic sense of direction did not work. Such behavior would be similar to a bat flying into a wall in a fog. When animals cannot see where they are going, they either turn and go back to where their sense of direction recovers or they remain calm and wait for things to clear up. The same rationale applies to whales. If their biosonar system was working before they approached the beach, they could easily sense both the approaching shallow water and the rough surf. They would turn and go back to the open ocean where they could navigate. On the other hand, if they had lost their ability to navigate long before they got near the beach, they would have no idea they were swimming into a sand trap and no idea which way to swim to avoid a stranding. Look again at the video above; you can see the whales are clearly LOST. These ignorant stranding concepts are promoted mostly by the "save-the-beached-whale" groups. The only reason for such nonsense is to get larger donations from the unknowing public. These nonprofits make a lot of money. They have learned that humans give more freely if they believe the whales are healthy and just made a stupid mistake because they love each other so much that they would rather die than to go on without one of their family. The nonprofits are right. If the public knew the whales had previously lost their sense of direction due to a pressure-related diving injury and will not survive unless they donated millions of dollars to treat them, they would never donate to push dying whales back out to the waiting sharks. Indian officials also suggested the animals were washed ashore due to some kind of diving accident caused by severe pressure changes generated above the epicenter of an underwater disturbance like an earthquake or a volcanic explosion. They do not yet understand the entire picture, but some Indian scientists are beginning to grasp the idea (link). They are on the right track -- seismic pressure waves can indeed cause sinus barotrauma in the cranial air spaces of the diving whales. Since their cranial air pockets act underwater as acoustic mirrors, such as injury would indeed knock out their acoustic sense of direction causing them to be lost at sea. It is easy to sort out which way the pod would swim if they lost their biosonar system. Water is 800 times denser than air so there is much greater resistance (drag) to swimming against the flow as compared to swimming downstream. This means that if we want to locate the natural undersea upheaval that injured them, we must trace the surface current back upstream from the stranding beach. When we look upstream for a seismic event that might have scrambled their navigation system, the most suspicious was a shallow Mw 4.8 quake that occurred at 07:42 am local time on December 19th, 2015. The epicenter was located in the North Indian Ocean at 1.85 N ; 90.95 E about 430 miles west of Simeulue Island, North Sumatra, Indonesia. Although the magnitude was listed as 4.8, many seismic stations listed the magnitude as high as 5.4 Mw. The default depth of the focal point was 10 km but the quake might have been as shallow as 3-4 km. The closer the focus is to the rock-water interface, the stronger are the seismic p waves that cross into the water. In fact, if the focus were less than the length of one complete p wave, the seismic energy crosses into the water as if there were no interface at all. Very shallow earthquakes are the most dangerous to diving whales. History repeats itself. A pod of 147 short-finned pilot whales stranded at the same spot on January 14, 1973. In an amazing coincidence, a magnitude 5.4 earthquake occurred on December 14, 1972, at 1.34 S ; 89.17 E., ~300 miles from the quake that caused the recent beaching. Here's more: On Sunday, February 10. 1823, at 01:10 P.M. the East India Company's ship Winchelsea, on her passage from Bengal to England, when in 0.52 N ; 85. 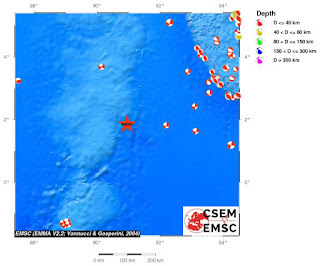 33 E. experienced a shock similar to that of an earthquake. Every individual was alarmed by a tremulous motion of the vessel, which gave a sensation as if it were passing over a coral rock, at the same time a loud rumbling noise was heard, similar to the rolling of a heavy barrel along the deck. The agitation and noise continued two or three minutes. See "Shock of Earthquake felt at Sea"
The shock that Winchelsea experienced in 1823 could easily cause a sinus injury in an entire pod of diving whales. If so, the whales would not be able to dive and feed themselves due to severe sinus pain. Sharks would be drawn to the injured pod. They would take a position behind so they could follow the scent and taste of the injured. They would not attack a hundred whales. Instead, they would lag behind, picking off stragglers. The pod would natural protect the senior members that possessed the pod's living memory of where to find food. Since the sharks would be trailing from behind, the safest place for the seniors would be 50 meters in front of the pod, with the main group between them and the trailing sharks. This might give human observers the idea that the pod was being led ashore by pod leaders, when in truth, the senior members were just as lost as the rest of the pod. They were all swimming downstream with the sharks bringing up the rear. The sharks would keep the pod moving. Some would feed and break away from the others, and other hungry sharks would join the progression to replace the ones that broke away. The parade would continue night and day until the sharks devoured the pod or until the surface currents guided the non-navigating whales to a sandy shore. 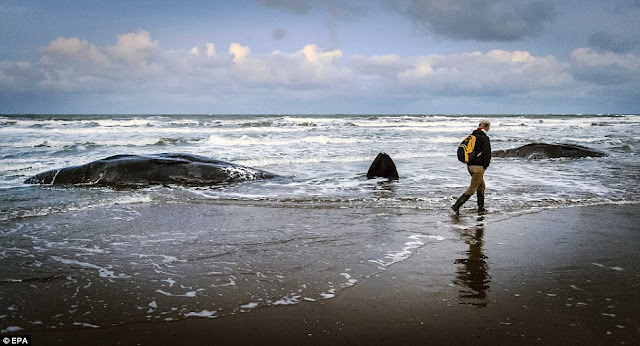 The odds would be extremely high that the stranding area would be covered with sand because the current guiding the whales is the same energy that carries sand to the shore to build beaches. Since both the lost whales and the sand are carried ashore by the current, pods will strand almost exclusively where beaches are building, not where sand is being washed away. And, since the pod is not feeding, they will arrive at the beach with no fresh food in their stomachs. Moreover, because all their fresh water comes from the food they eat, they will all be dehydrated. In fact, it is possible to determine how long it has been since the stranded pod was injured by gauging the degree of dehydration. One might also gauge the time of the injury by the overall physical condition of the pod. In this particular mass stranding, the surface currents carried this pod deep into the Bay of Bengal (see chart below). The currents then shifted west and directed the pod into the Palk Strait and then into the Gulf of Mannar. The pod then moved along the east coast until they were finally blown into the shore by a strong shoreward wind (you can see this in the videos). The distance traveled between the epicenter and the stranding beach when tracing the current is about 2,400 miles. Past experiences show that this just happens to be the average distance between seismic upheavals and beachings. The average time elapsed is about 21 days, thus, the average swim speed of the injured pod is 115 miles per 24-hour day. This agrees with the 1973 mass strandings in the same location. The upheaval that caused the strandings must fit the above averages. It must also be upstream from the beach. These confines eliminate many seismic events making it easier to select the most suspicious one. This particular quake was the only one that fit the necessary criteria. Chart of the surface currents. Read more on Navigation Failure in Stranded Whales. Dec 06: why did pilot whales beach in the Everglades? Copyright 1972 thru 2016: This material is the copyrighted intellectual creation of Capt. David W. Williams, and registered with the Writer's Guild of America—Reg. No: 10608118. The reproduction and use of any part or all of this intellectual creation in any form, including film, is strictly prohibited. In particular, no part of these web pages may be distributed or copied for any commercial purpose. No part of this intellectual property may be reproduced on or transmitted to or stored on any other website, or in any other form of electronic retrieval system or used in any film or book; however, you may link to this website without permission. Reference this web page as the source when quoting. Send email request for any other use.